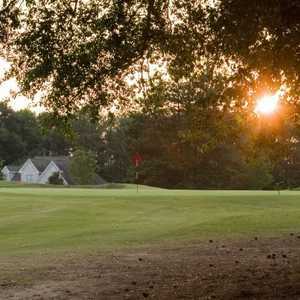 SNELLVILLE, Ga. -- There's a reason people keep coming back to play Summit Chase Country Club. Located in Snellville, about 20 miles to the northeast of Atlanta, the golf course is comfortable and familiar, with some of the most consistently good golf you'll ever find on a course. Summit Chase has been family has owned and operated since 1980. Summit Chase used to call itself "a country club in the country." That moniker no longer applies, as the suburban growth has long since removed most of the country from the area. The club continues to offer a welcoming atmosphere to visitors, from the friendly cart attendant who greets you at the bag drop area (tips are appreciated) to the staff in the pro shop to the food and beverage crew. The club has been owned and operated by the Britt family since 1980. Van Britt, the owner, has always set the bar high for his club and has helped it develop a reputation as a course for players. That standing has been embellished by the establishment of an annual four-ball tournament that draws the best players in the state. 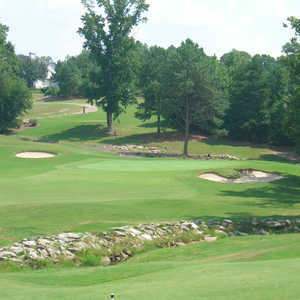 The club has hosted numerous Georgia State Golf Association championships and qualifiers, among them 1986 Georgia Mid-Am that was won by Allen Doyle. And the club has always had a bona-fide player as its head professional, going back to the days when Stephen Keppler nearly won the PGA Tour's BellSouth Classic. David Epps, the longtime head professional, has been a competitive player in the Georgia Section for years. Assistant Kenny Langlois played college golf and UC-Santa Barbara. The course was built in 1973 by Ward Northrup back when Snellville (a city whose slogan is "Everybody is somebody in Snellville") literally had one traffic light. Summit Chase is built within a subdivision, but you barely know it on the golf course. There are some houses built around the course, mostly on the back nine, but none of them are intrusive. Northrup built 18 holes that are quite diverse. Summit Chase's two nines are complete opposites. The front side is relatively open and easy to attack; you'll get plenty of chances to make birdies there. The back nine plays longer, requires better skills off the tee and can be quite penal in places. The course plays 6,816 yards from the back tees, 6,311 from the white tees and 5,583 from the green. There's a hybrid set that plays 6,091. The front starts with a 413-yard par 4 that plays up a gradual hill to a large green. The best birdie opportunities come in the middle: a 353-yard fourth hole that plays to a blind green, the 368-yard fifth hole with out of bounds on the left and the 500-yard sixth hole that doglegs left around a stand of pine trees. The front ends with the difficult ninth, a 578 yarder that plays slightly downhill. There are trees all the way down the left side, and any tee shot hit to the right will end up behind the trees at the rear of the range. There are bunkers in front of the green and a pond to the left. Par here is a good score. The back nine opens with a difficult 369-yard par 4 that requires a drive over water and into the bank of a steep, uphill fairway. A big hitter has a huge advantage on this hole. Once you arrive at the green, you'll find it to be a sloping masterpiece of trickery. The most difficult hole on the course is No. 14, a 449-yard par 4 that requires an accurate drive. Anything that drifts to the left is likely to roll down the sloping fairway to the tree line and possibly out of play. Anything to the right will likely find the trees that divide the hole from No. 13. In addition to the length, there's a large hardwood tree near the right side of the green that guards the entrance. 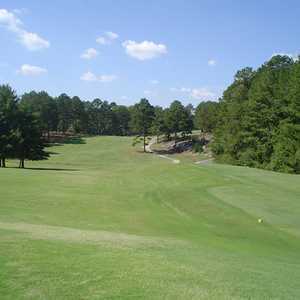 Summit Chase Country Club's closing hole is a 427-yard par 4 that requires a good drive to a narrow target. Properly played, a golfer will have a shot of 150 yards or less into a green on the other side of a pond. A short drive will leave you with a decision to bomb a fairway wood over water and onto the green or layup and take your chances of getting up and down. The par 3s on the course are entertaining. They range from the 114-yard 16th hole, which has produced more than a few aces over the years, and the 187-yard eighth hole, where tournament organizers tuck the pin in the back right to prevent anyone from lucking their way into winning a new car. The 150-yard 11th is at the highest elevation point on the course and has some exposed granite in the fairway. Summit Chase has always had some of the best greens in the area. The course was blessed to have the legendary Palmer Maples as its superintendent for 16 years. Maples, who retired in 1997, served as president of the Golf Course Superintendents Association of America and is one of three superintendents inducted into the Georgia Golf Hall of Fame. Maples took pride in the bentgrass greens at Summit Chase and left the course in wonderful condition. The greens were transitioned to Champions bermuda in 2012 and are today under the watchful care of Sam Crowe, who returned to the Snellville area in 2014 after serving as superintendent at The Reserve at Lake Keowee in Sunset, S.C. The range has plenty of hitting bays. You can hit off grass for much of the spring and summer, but be prepared to back up and use the mats. The range balls don't cost any extra, which is a nice perk. The range is a little short, and they ask big hitters to keep their driver in the bag rather than risk bombing players on the eighth tee and ninth fairways. The food at Summit Chase is outstanding. A reasonably priced buffet is available on Sunday afternoon and Wednesday night, with fried chicken and macaroni and cheese a weekly staple. Executive Chef Stephen Chandler's beer cheese soup, offered every couple of months, is one of the favorites and is guaranteed to draw a crowd. Summit Chase is one of my favorite clubs in the metro area. In all my visits over the years, I've never left disappointed. The golf course is fun to play, especially the front nine. The back nine has elicited many ill thoughts over the years, primarily about the poor shape of my own game. The conditions are always good and the greens are outstanding. If you get a chance to play here, you won't regret it.